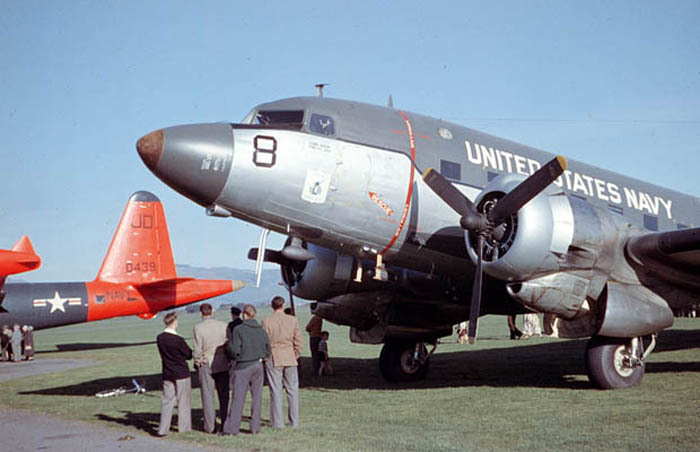 In the beginning, it was the arrival of the US Navy and Air Force aircraft at RNZAF Base Wigram in 1957 for Operation Deep Freeze. How exciting it was to be surrounded by "modern" American military aircraft versus the pathetic British junk we were still using from the 1940's. 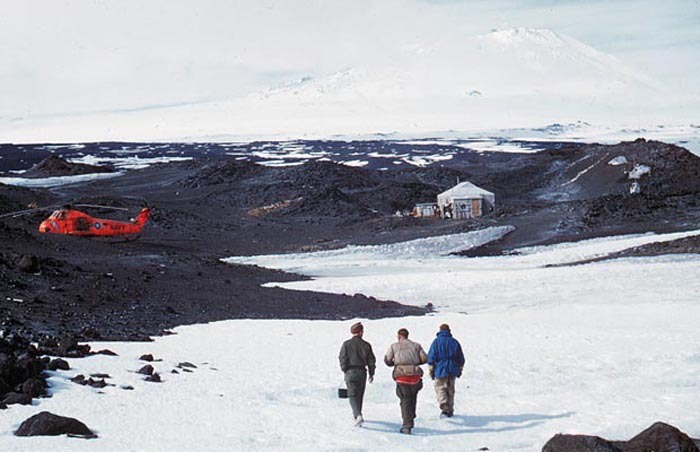 Then, in 1959, as a 20 year old RNZAF officer and pilot, it was my good fortune to be selected for participation in New Zealand's Antarctic program. 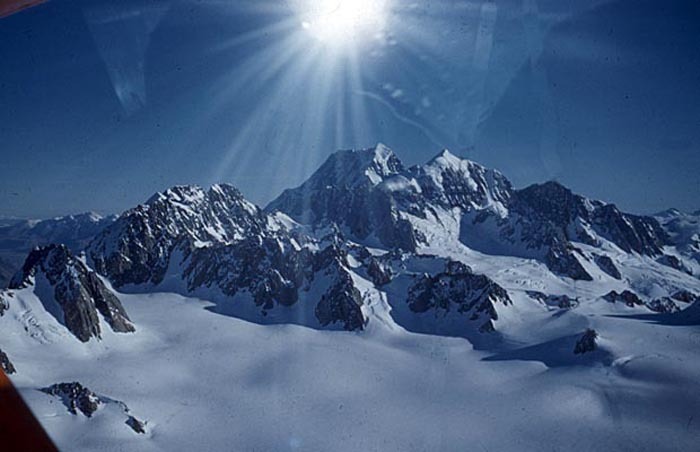 The extensive specialized training included a lengthy period in New Zealand’s Southern Alps, learning the techniques of glacier travel and survival in extreme cold environments. 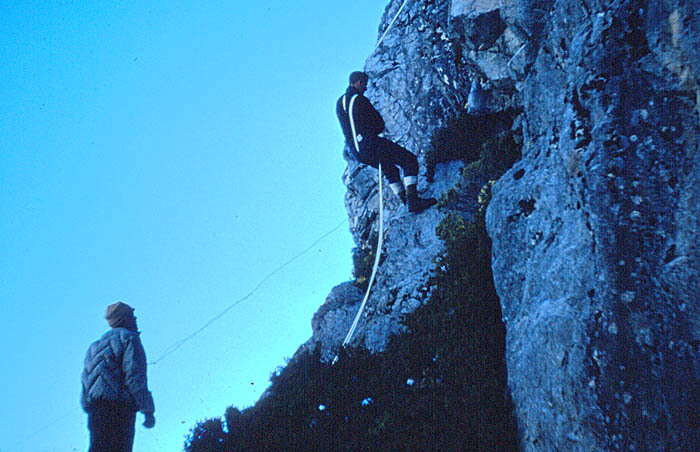 By today's standards our climbing equipment was primitive: wood-shaft ice axes, ten point iron crampons, manila ropes, no harnesses or mechanical descenders, leather boots and inadequate clothing. 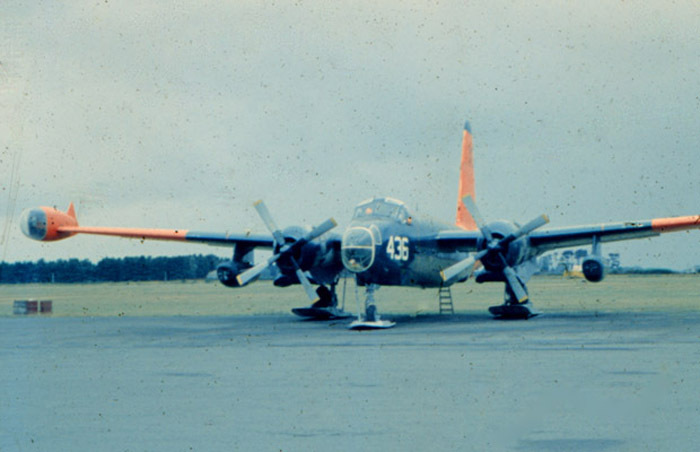 RNZAF Base Wigram 1959: The Antarctic Beaver, NZ6010. 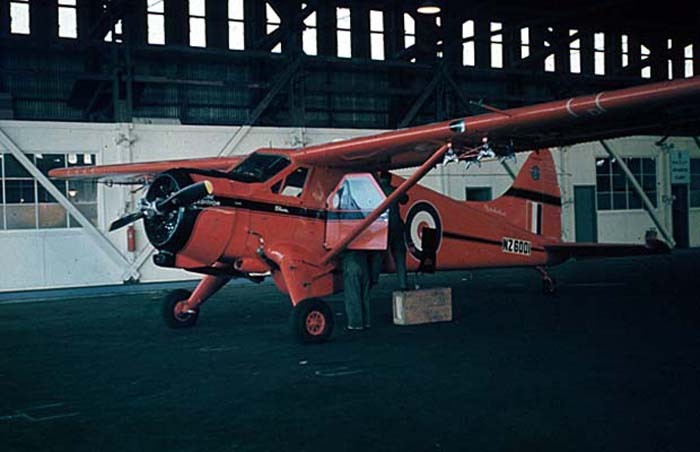 RNZAF Base Wigram 1959: The Antarctic Auster Mk.7, NZ1707 - with metal prop & cartridge starter! Mount Cook airstrip 1959: The RNZAF Beaver ready for the Glacier flying. Fitted with wheel-skis. 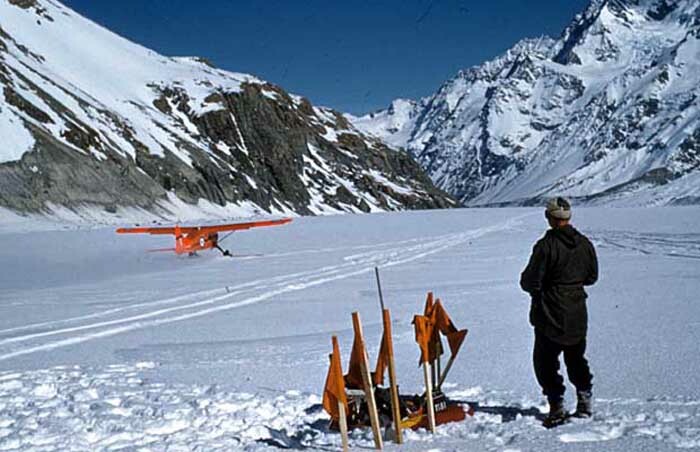 Mount Cook airstrip 1959: The Beaver returning from the Glacier with wheel-ski landing gear. 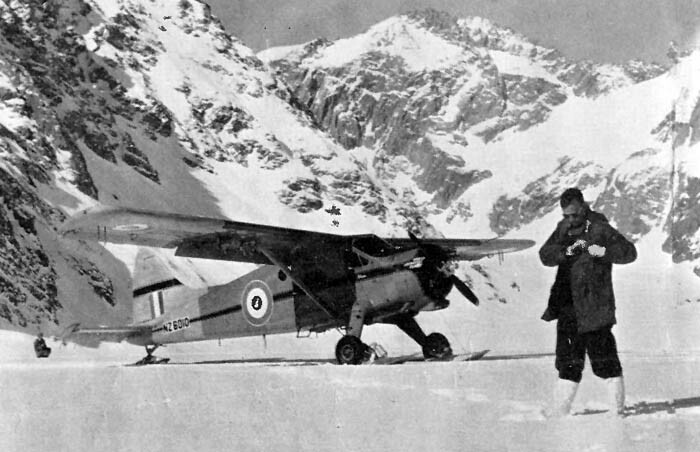 Upper Tasman Glacier 1959: The Beaver waiting for the next ski training flight. Upper Tasman Glacier 1959: The Beaver taking off downslope. Graeme Derby watching. 1959: Mounts' Tasman and Cook from the western side - as seen from the Beaver. 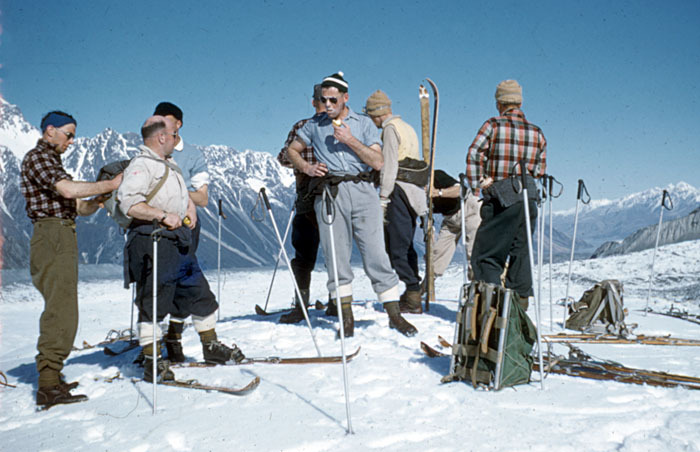 Tasman Glacier 1959: Ice axe & crampon training with NZ's greatest alpinist, Harry Ayres. 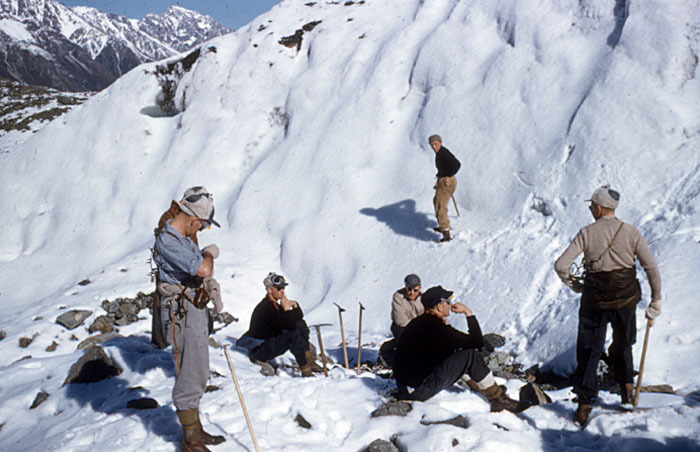 Tasman Glacier 1959: Rappelling the old fashioned way - no harness, no fancy descenders. 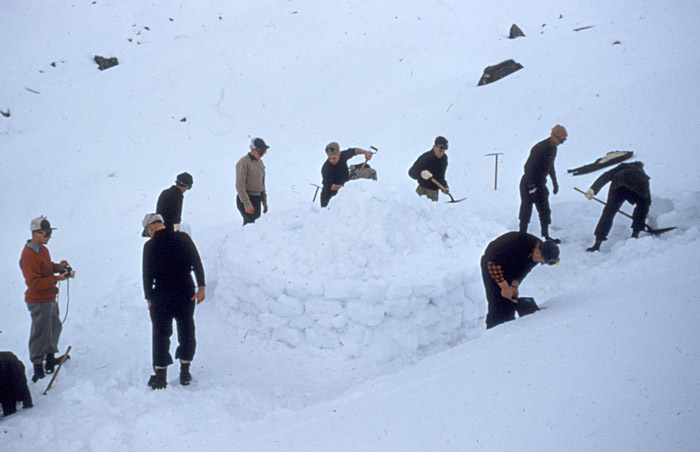 Tasman Glacier 1959: Constructing an igloo for use as a survival shelter. 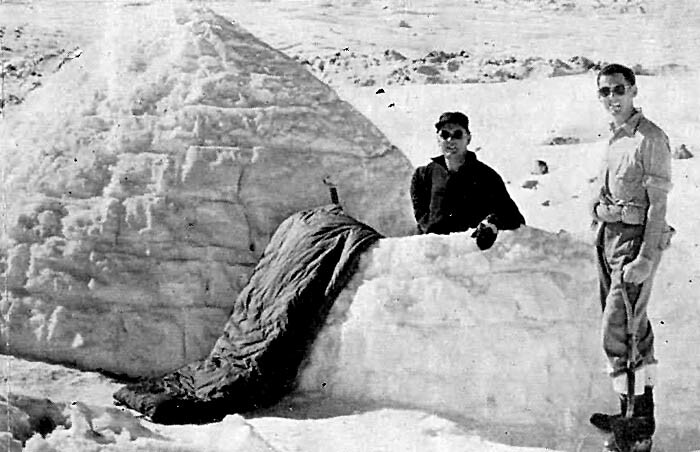 Tasman Glacier 1959: The completed igloo with Wally Tarr and Pete Rule residing. RNZAF Base Wigram 1957: A USN VX6 R4D-8 "Super-Dak". To be fitted with wheel-skis at McMurdo. 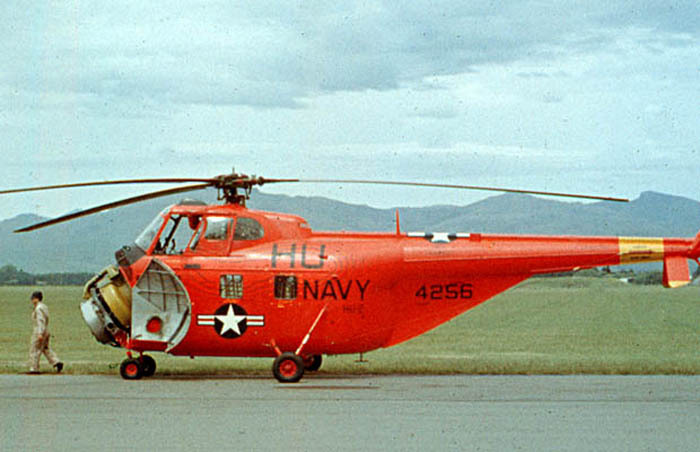 RNZAF Base Wigram 1957: A USN Sirkorsky S-58. RNZAF Base Wigram 1957: A USN VX6 Lockheed Neptune P2V-7LP. "2 turning, 2 burning"
To complete the preparation for Antarctic operations we began training for ski-plane take off and landings on the sloping Tasman Glacier. 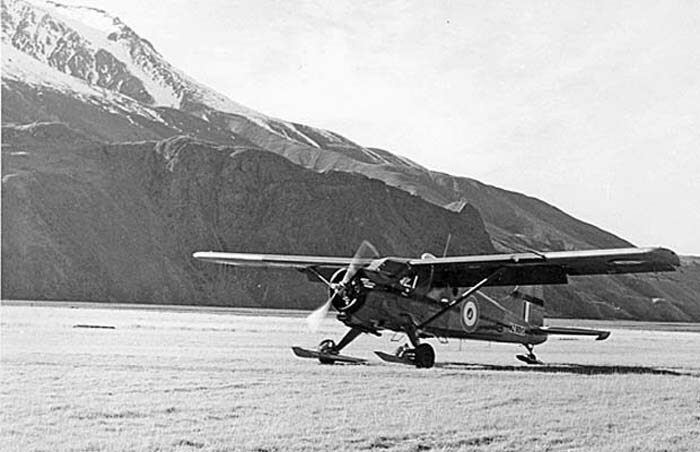 The flying was done in the RNZAF's Antarctic Beaver and Mount Cook Airline's ski-wheel Austers. 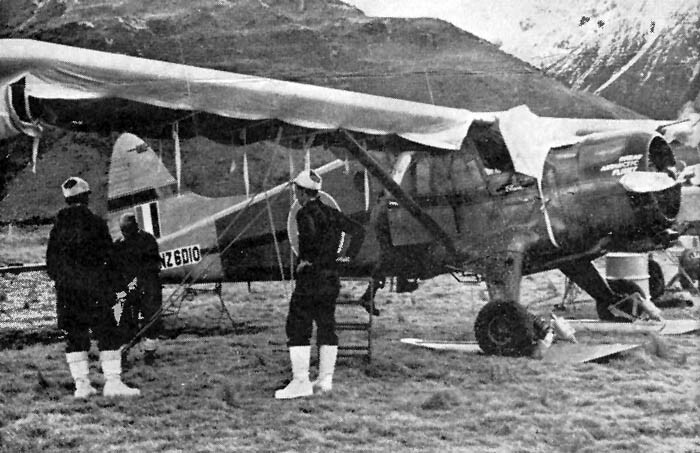 The so called RNZAF 'Antarctic Auster' remained at Wigram, although it's performance was superior to the Mount Cook aircraft, but lacked the wheel-ski landing gear for use between Mount Cook airfield and the Tasman Glacier. 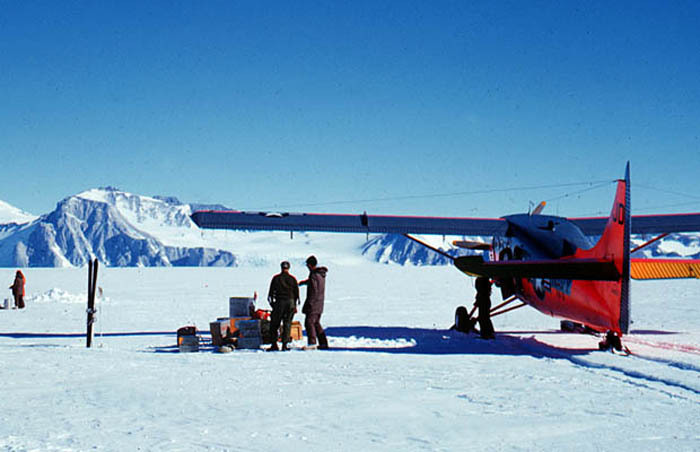 Once in the Antarctic, this Auster would be equipped with basic skis for it's landing gear. 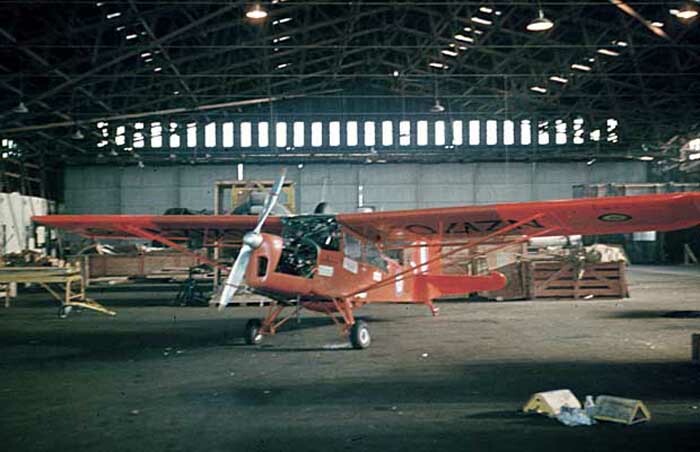 In the spring of 1959, the Beaver and Auster were shipped [NZ Navy] to McMurdo Sound with a Unit complement of three pilots [Les Jeffs, Bill Cranfield and Pete Rule] and the maintenance crew under the control of Wally Tarr. 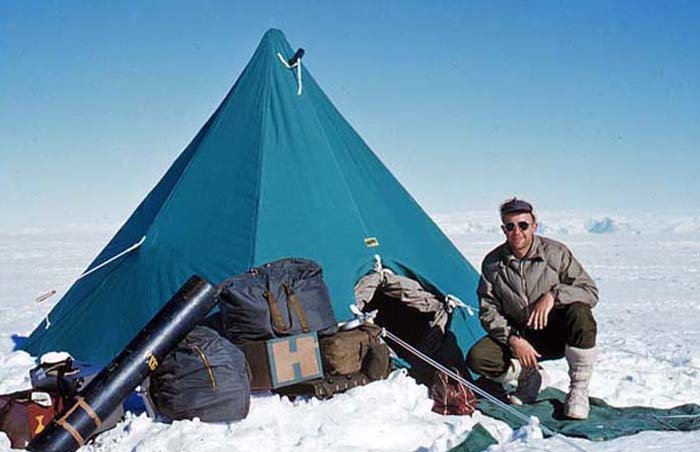 Myself and Graeme Derby remained in New Zealand as backup pilots, and on assignment for the following season in the Antarctic [summer 1960/1961]. 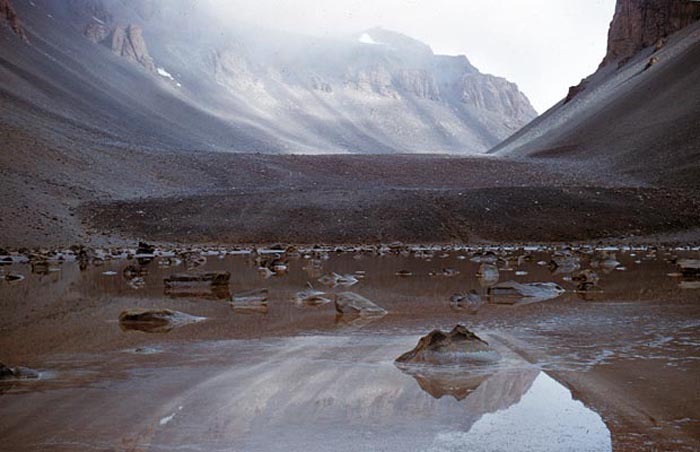 Early in 1960, the Beaver crashed near the Beardmore Glacier, not far from the South Pole. 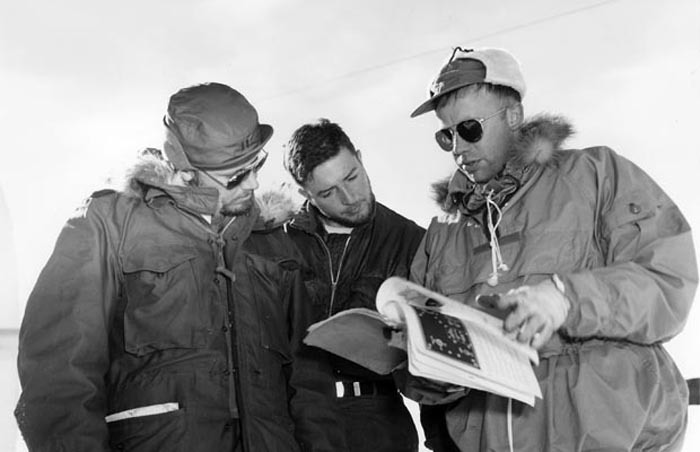 Fortunately the two pilots, Les Jeffs and Pete Rule survived the accident and were retrieved from the heavily crevassed glacier of impact by a combined effort from the RNZAF Auster and a US Navy R4D5 [DC3]. 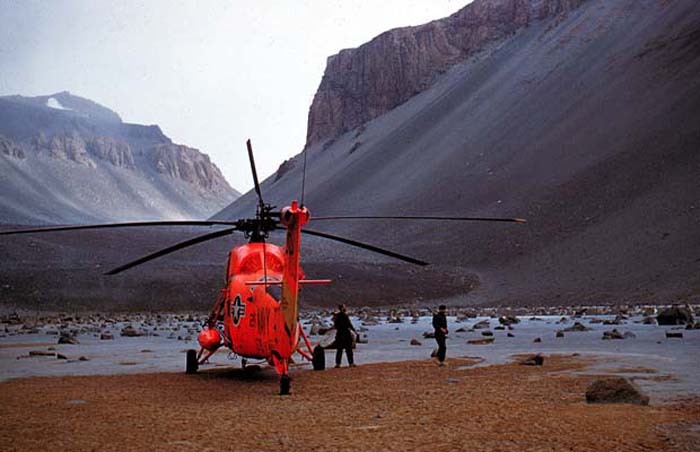 This accident heralded the end of the RNZAF Antarctic Flight, although a tentative plan was made to replace the Beaver with a DHC Otter [ex-RAF Antarctic aircraft]. 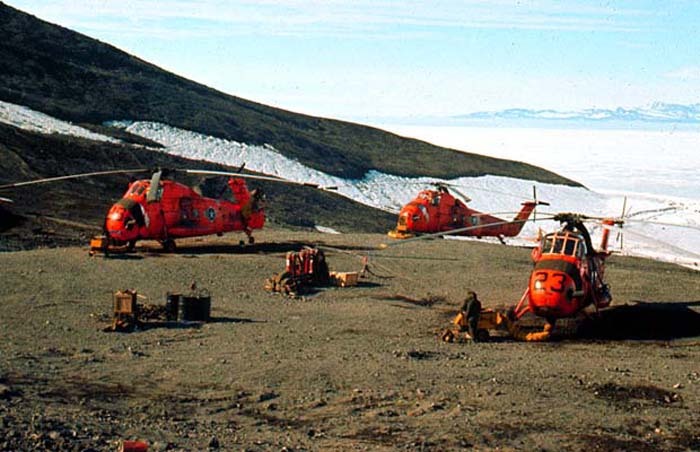 With the future of RNZAF participation in New Zealand's Antarctic program in doubt, the Flight members were reassigned to their original units and/or Squadrons. 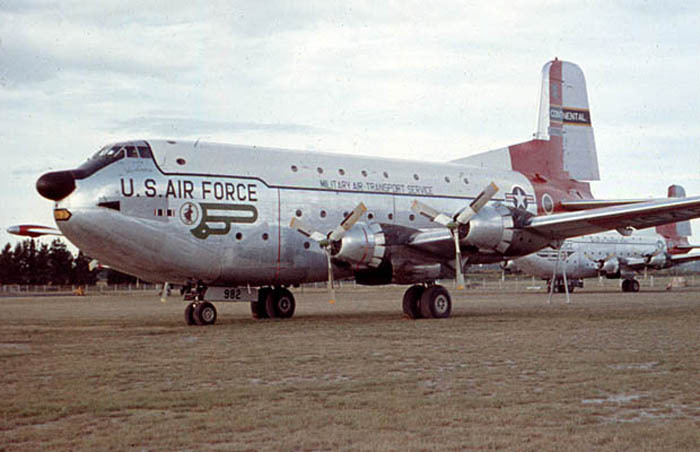 I ended up posted to 41 Squadron [Bristol Freighters] at RAF Base Changi in Singapore, only to make the fatal mistake of again volunteering for Antarctic duty to begin in the summer of 1961/1962. On arrival back in New Zealand [RNZAF Base Wigram], I was advised that the rebirth of the Antarctic Flight had been shelved. 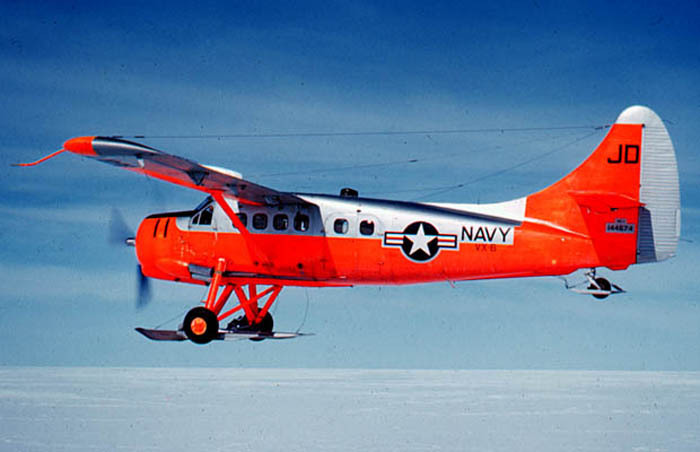 Ultimately, the good news was my assignment to the US Navy Squadron VX6 to fly their DHC Otters [UC-1], based at McMurdo Sound for the summer of 1961/62. 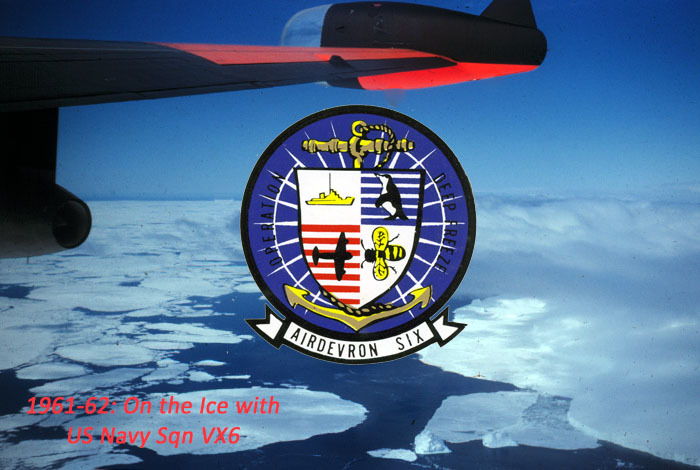 November 1961 - Joining the US Navy Squadron VX6 at McMurdo Base, Antarctica. 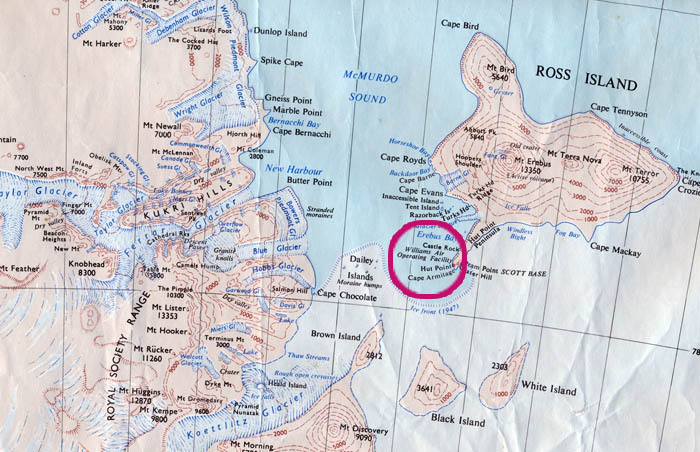 Map of Ross Island, McMurdo Sound and the western coast. The red circle covers the Base. BOQ-3 at McMurdo. My home for four months "On the Ice". Lt Gary Dyer painting totems! VX-6 Otter in flight from Williams Field to the Beardmore Base. 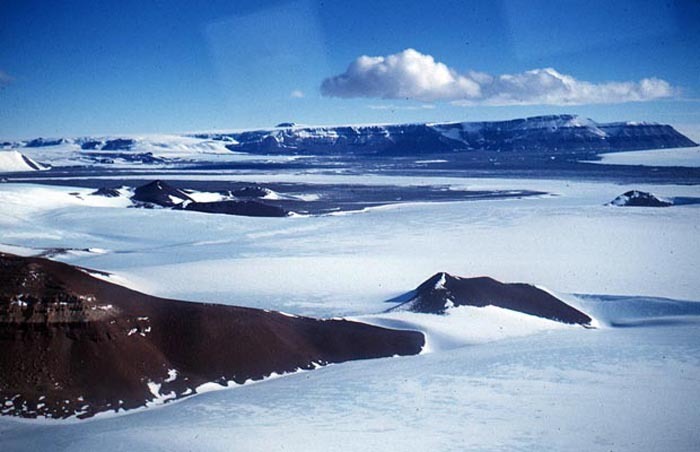 Flying north along the western coast from McMurdo to the Newnes Ice Shelf. With the VX6 Otter at the Beardmore Base, looking towards the Beardmore Glacier mouth. 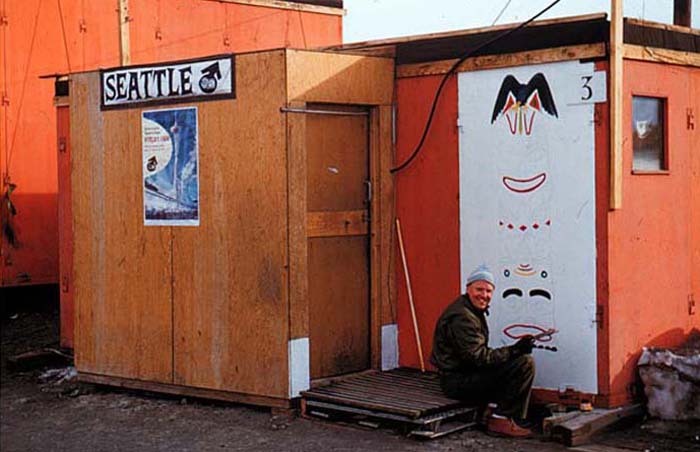 Me at home in our semi-permanent camp at the Beardmore Base. 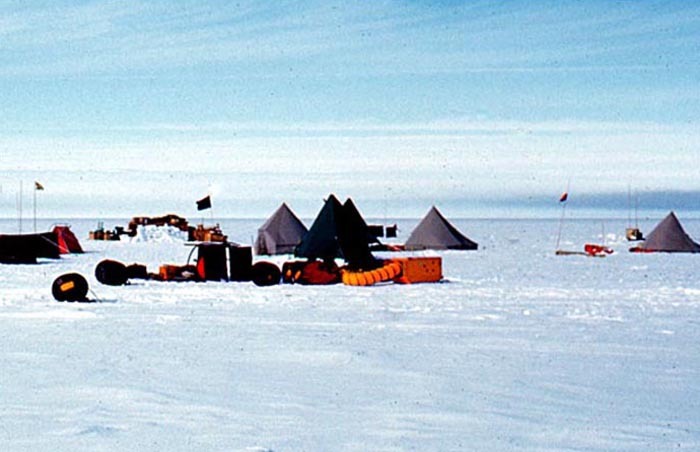 The tent sites and aircraft support equipment at Beardmore Base. 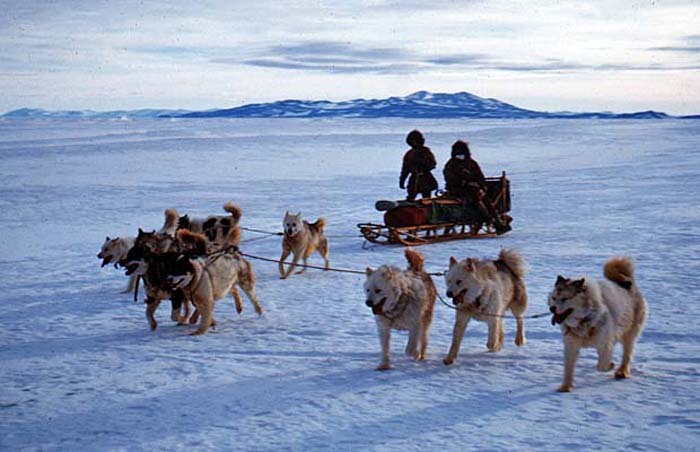 The New Zealand sled dog team out for a run from Scott Base. 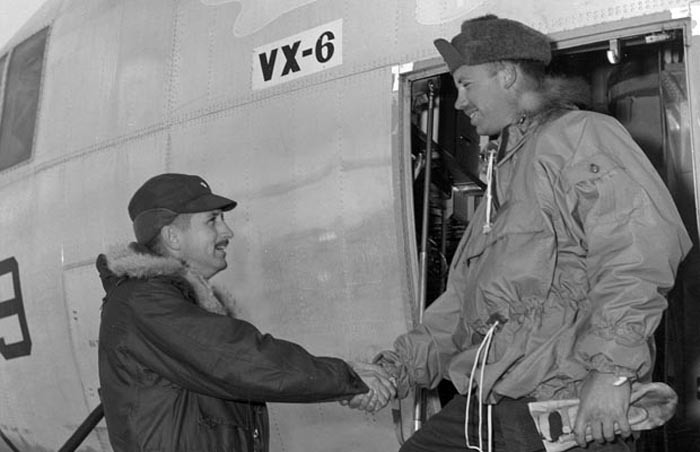 And so it was that I found myself on a VX6 C-130 BL aircraft flying from Christchurch to McMurdo in mid November 1961. Prior to my departure The Squadron checked me out on the Otter they maintained at Christchurch. It felt like a big clumsy Beaver, with a propeller so slow when taxiing, you could almost count the blades! But as a single engined workhorse it certainly could lift a load. 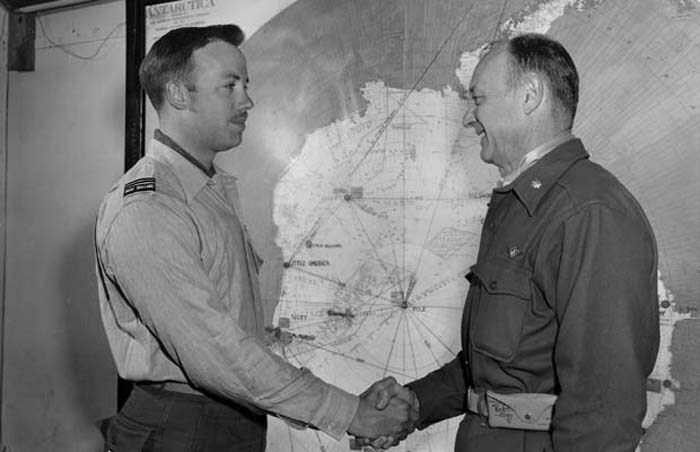 At McMurdo, I was assigned to fly with Lt. Ron Bolt USN on numerous missions, initially to and from the Beardmore Glacier Air Facility and later as far north as Lady Newnes Ice Shelf. There were also missions to Little America and Roosevelt Island. 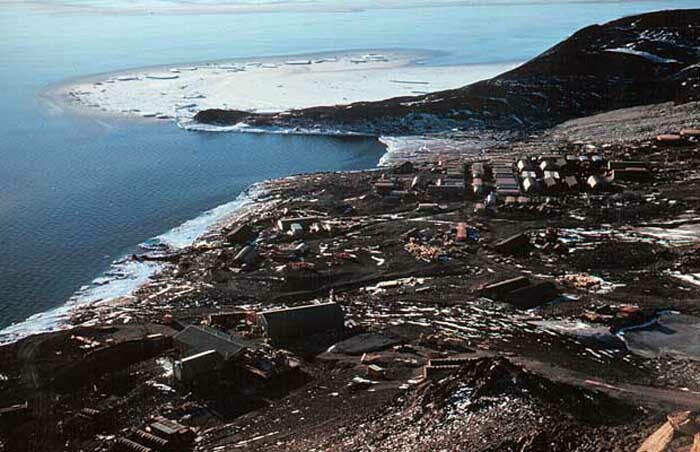 Our permanent base was in the "City" at McMurdo [quartered in BOQ3 with a group of US Navy pilots]. 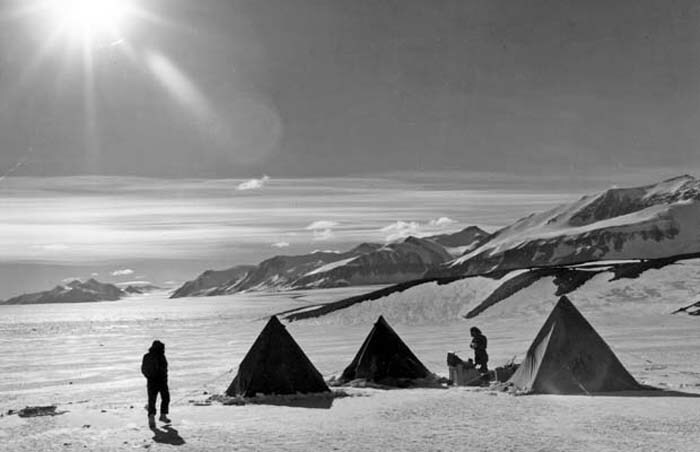 However much of the time I spent on the Ice was lived in tents at remote locations. Between Otter missions I was able to acquire some copilot seat time in the C-130 BL, the Neptune P2V-7LP, the Douglas R4D-8, the Douglas R4D-5, the Sikorsky HUS S-58 and the Connie R7V-IP. 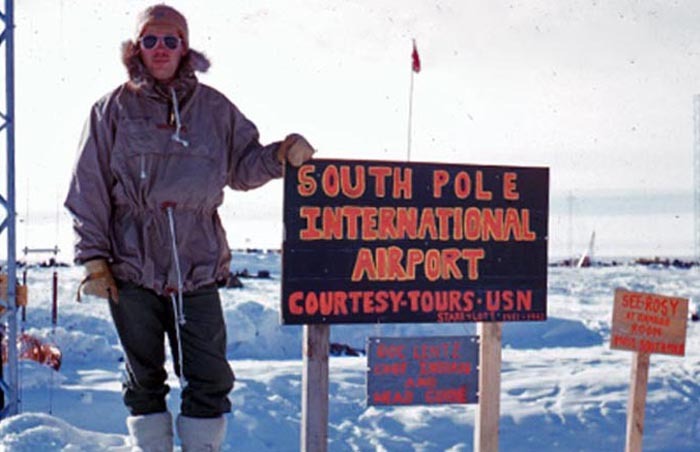 The C-130 flights took me to South Pole Station, New Byrd Station and to and from Christchurch. 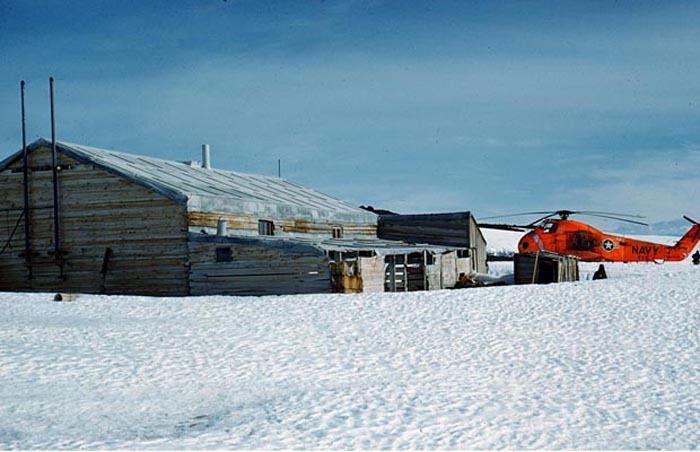 The S-58 helicopter flights took me to the Dry Valleys and the various huts [on Ross Island] from the early 20th Century expeditions of Scott and Shackleton. 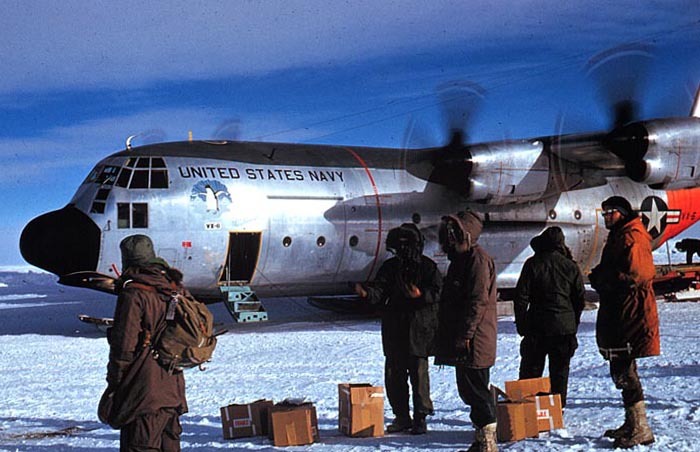 The R4D flights included resupply missions, both airdrop and ski-landed, north and south of McMurdo. In late February, I volunteered [again stupidly!] 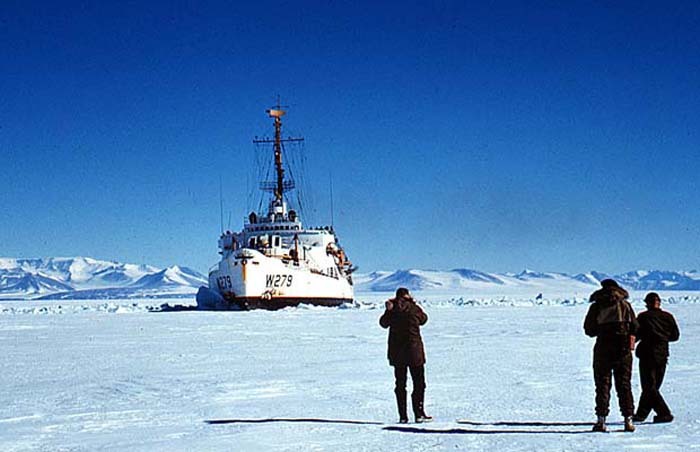 to return from McMurdo to Christchurch on the Icebreaker USS Glacier [GB4]. A terrible seven days at sea with jammed roll control stabilizers. The lesson from all my Antarctic adventures: Don't ever volunteer for anything in the military! 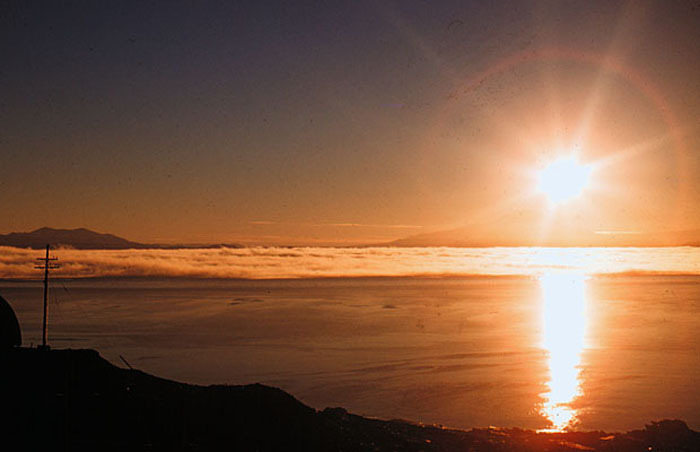 The midnight sun showing through an ice fog - seen from McMurdo Base. On Crater Hill looking north to Mt Erebus. 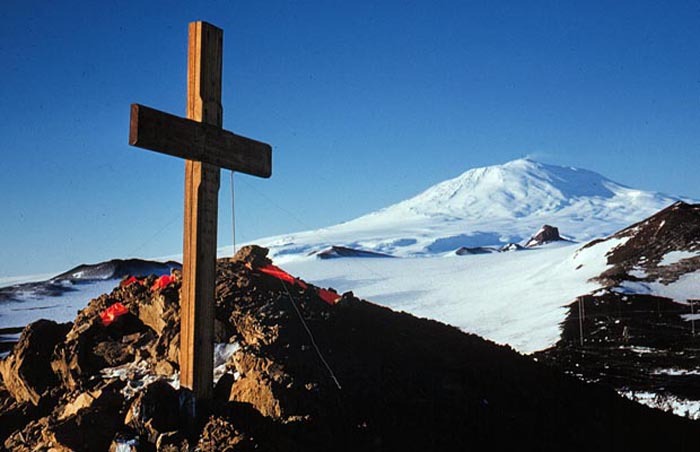 Cross in memory of Capt Scott & Party, 1912. 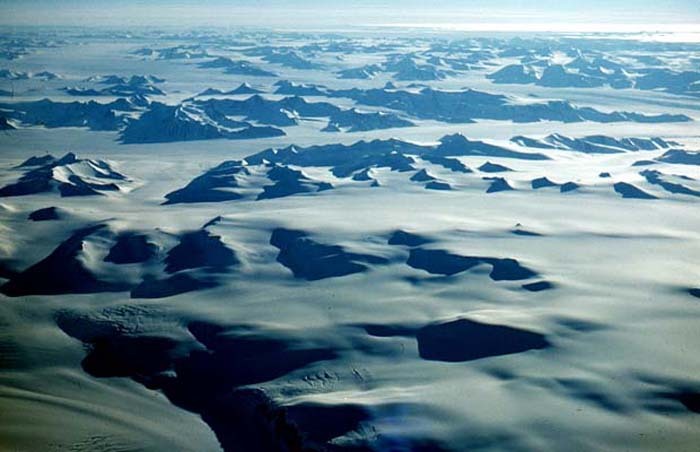 Looking down at Cape Royds, on lower right. Mount Bird on the upper left. 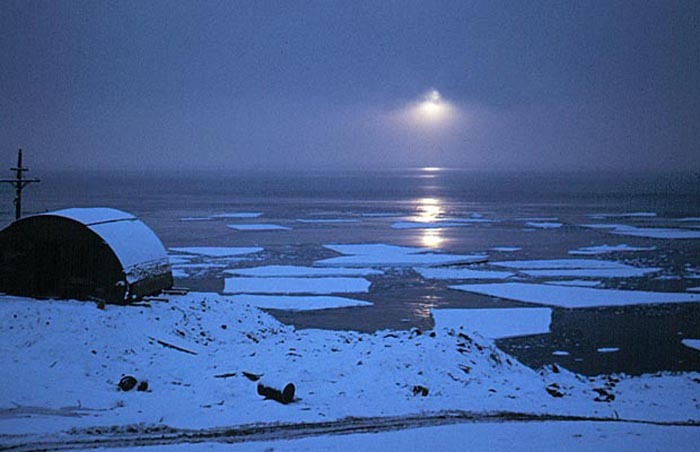 Captain Scott's 1912 Polar Expedition Hut on Cape Evans. On Cape Royds. 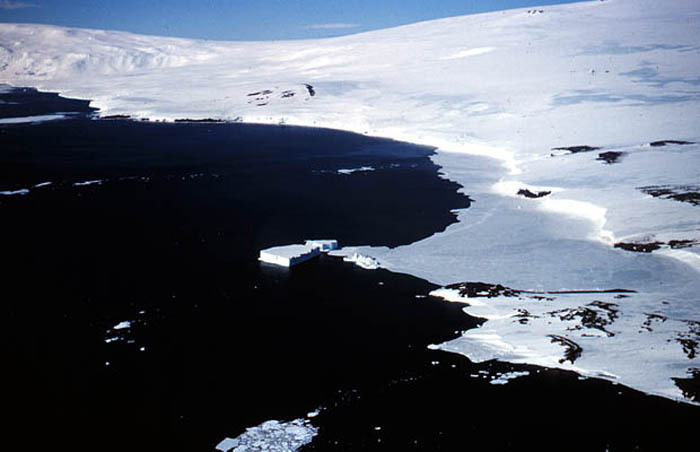 Shackleton's 1907 Polar Expedtion Hut in the background. 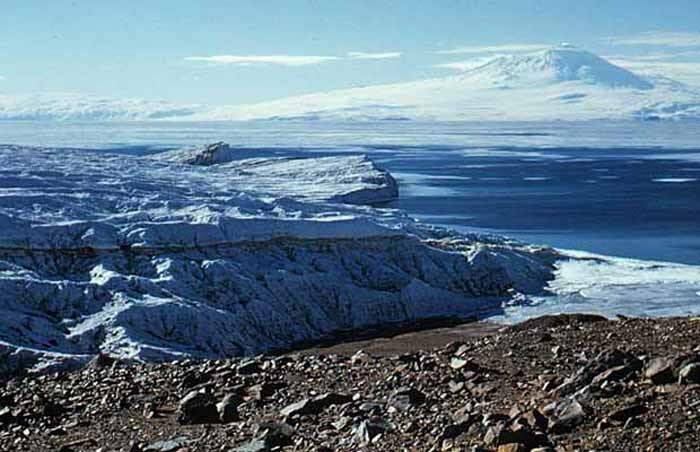 Looking east to Ross Island across McMurdo Sound from the Ferrar Glacier. 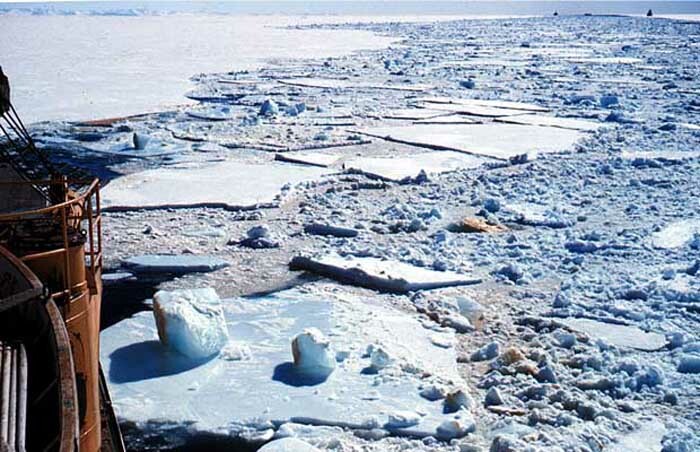 A free water pond in the Wright Dry Valley at an air temperature of - 10 C.
Onboard the Icebreaker USCG Eastwind, looking north along the break path. 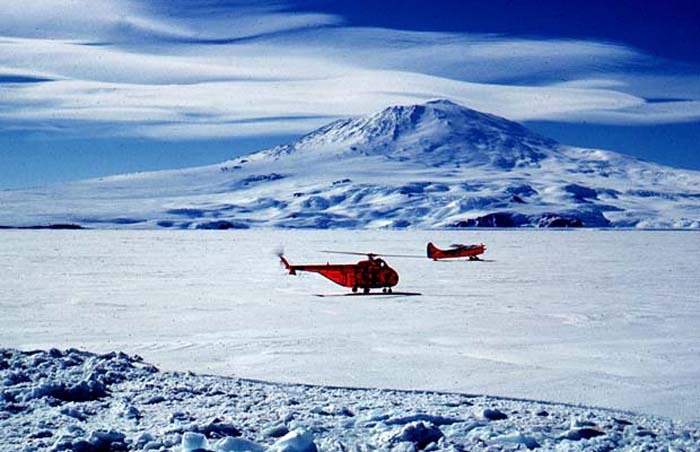 Onboard the Icebreaker USCG Eastwind, looking towards the 12,500' volcanic peak of Mount Erebus. 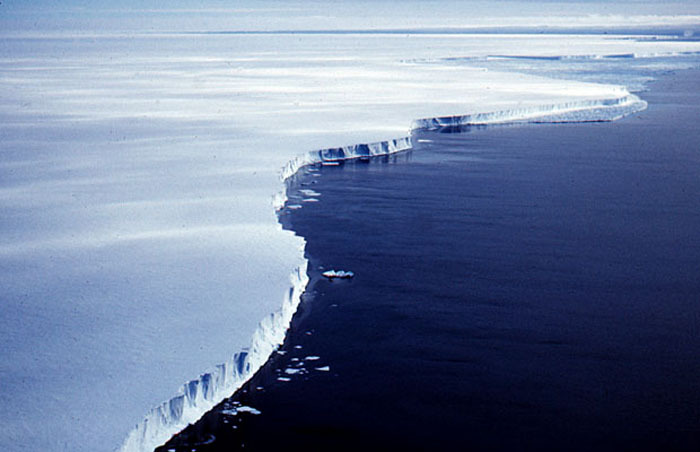 The northeastern edge of the Ross Ice Shelf, near Roosevelt Island & Little America. 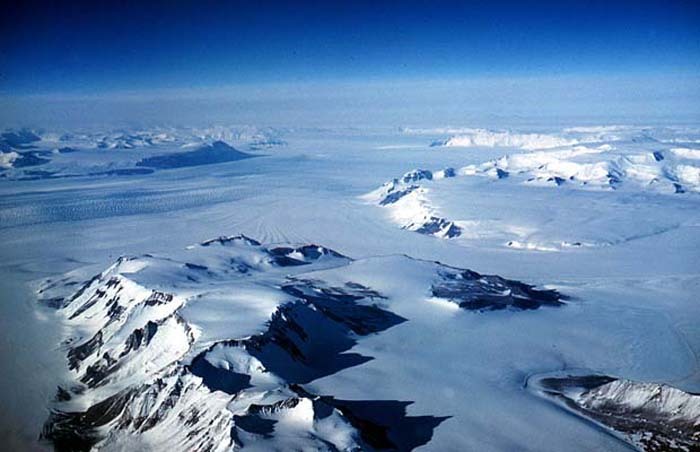 The Antarctic continent from 24,000 feet, flying south over Cape Adare to McMurdo Base.